We love bread. We know, obvious statement, but still, we really love bread! So does Chef Paul Lewis, which is why it’s such a big part of our operations at Indianola in EaDo. We’ve hired John Weatherly to manage all of our baking needs. Although John has a strong background in pastries, he’s been our bread guru since we’ve opened! From Vinny’s pizza dough to sourdough to chocolate cinnamon babka, John is on it! 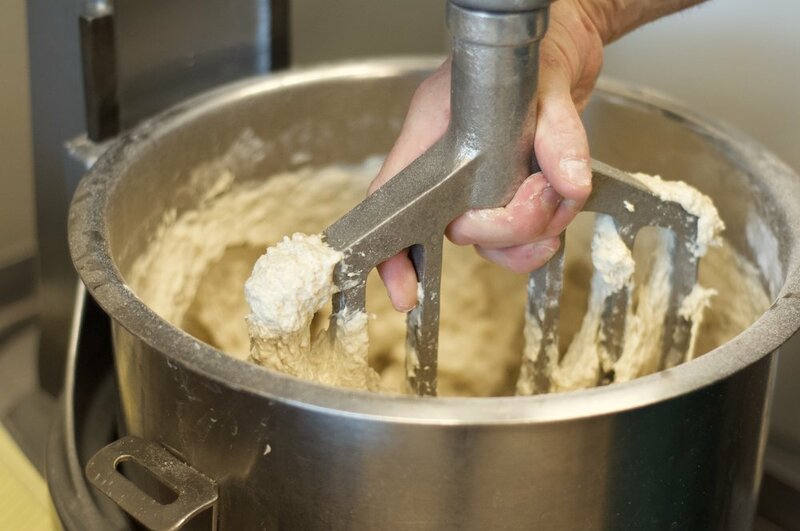 Here are the steps he follows to make our favorite sourdough at Indianola, which you can sample in a few different ways on the menu: daily sourdough served with salted butter, mushroom toast and the bread in the panzanella salad. We only use 5 ingredients. Yes, simpler is often better. what is a sour dough starter? 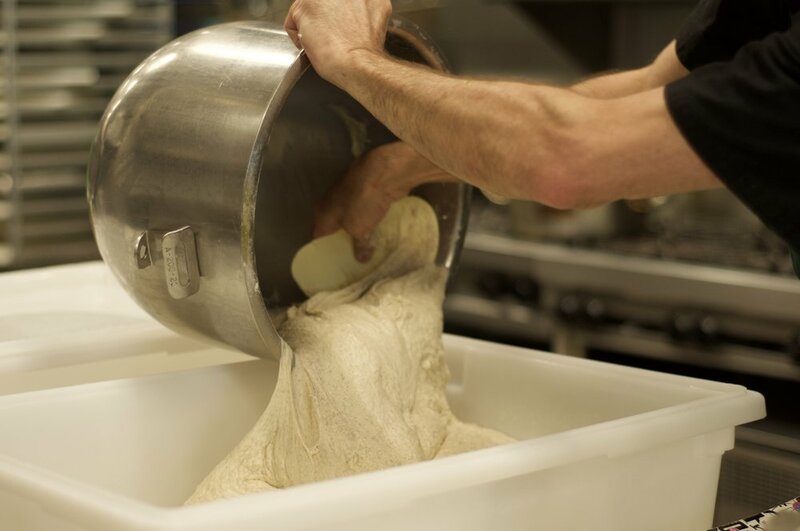 A sourdough starter is how we cultivate the wild yeast in a form that we can use for baking. Since wild yeast from organic grapes are present in all flour, the easiest way to make a starter is simply by adding flour, water and wild yeast. Allow it to rest and after a day or two, bubbles will start to form in the starter, indicating that the wild yeast is starting to become active and multiply. To keep the yeast happy, we feed the starter with fresh flour and water over the next several days, until the starter is bubbly and billowy. Once it reaches that frothy, billowy stage, the starter is ready to be used. 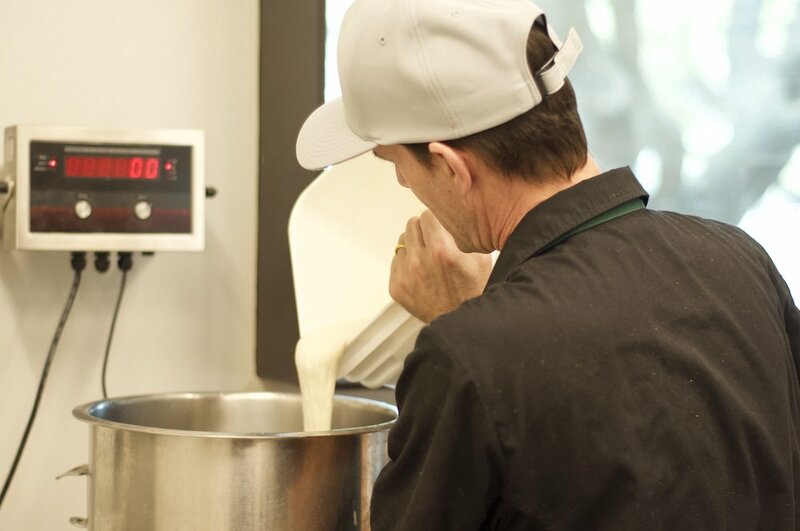 We’re fortunate to use Revival Market’s starter, but we still feed it every day to keep the yeast active. As Ryan said, we’re fostering a living thing, and we take very, very good care of it. Step 1: Mix the ingredients. Step 2: Let the dough sit for about 45 minutes. Step 3: Mix again for another 90 seconds while adding salt. Step 4: Place the dough into an oil container and begin the folding process. Step 5: Fold every 30 minutes for 4 hours. It’s a long process but it’s so worth it. Step 6: Shape the dough into rounds and let it rest for 30 minutes. Step 7: shape again to give final dough tension. Place the dough into baskets of your preferred shape and put into refrigerator for 18-24 hours. Step 8: Take dough out of baskets and place onto semolina dusted peels. Step 9: Place dough in a 450 degree oven with steam for 45 minutes. Turn every 30 minutes to ensure even baking. Step 10: Take out of the oven and enjoy! We like to enjoy it with our salty butter or topped with mushrooms, goat ricotta and anchovy vinaigrette.